Jules de Balincourt is a Paris-born painter currently living and working in Brooklyn, New York. After living in several European countries during his childhood, de Balincourt settled in California around the age of 10. In 1998, Jules earned a BFA from the California College of Arts and Craft in San Francisco, followed by an MFA from Hunter College in New York in 2005. A defining moment came in the early 2000s, when Zach Feuer saw de Balincourt’s work at an Open Studios event at Hunter; shortly thereafter, in 2003, Feuer offered de Balincourt the opportunity for a solo exhibition at his gallery in Chelsea. De Balincourt frequently paints on board rather than canvas, giving the work a rough, raw texture, and uses an array of bright, rich colors. His works range from geometric and practically abstract to Pop-like figurative painting of Americana themes, reminiscent of Jasper Johns (American, b.1930). While de Balincourt intends to offer social commentary in his work, sometimes verging on anti-conservative propaganda, he often does so with a playful sense of humor. In his painting U.S World Studies II (2005), a recognizable map of the United States is rendered in a garish rainbow of colors, showing rectangular-shaped states jumbled throughout and purposefully out of order or misplaced. 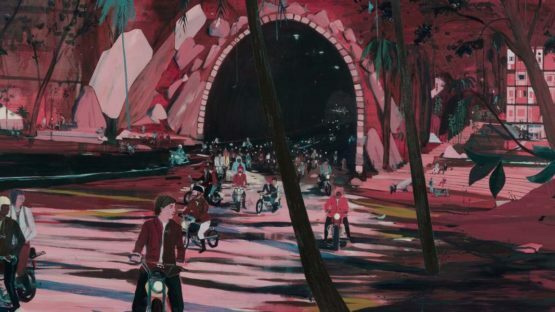 Jules de Balincourt has contributed to numerous exhibits around the world, including recent solo exhibitions at the Deitch Projects gallery in New York and the Mori Art Museum in Tokyo, Japan. Jules de Balincourt’s paintings are not very consistent. There are big ones and little ones, crowded ones and empty ones, paintings filled with figures and others that appear almost entirely abstract. Sometimes he paints explosions, but they’re sort of benign and cartoonish, opening like jazzy flowers. De Balincourt paints views and people and maps and words, pretty much always on birch panels using thin oils. There’s one piece showing a man sticking something in a bin; and there’s a cursory portrait of Chelsea Manning, hung high on the wall, as though removed from the rest of the world.